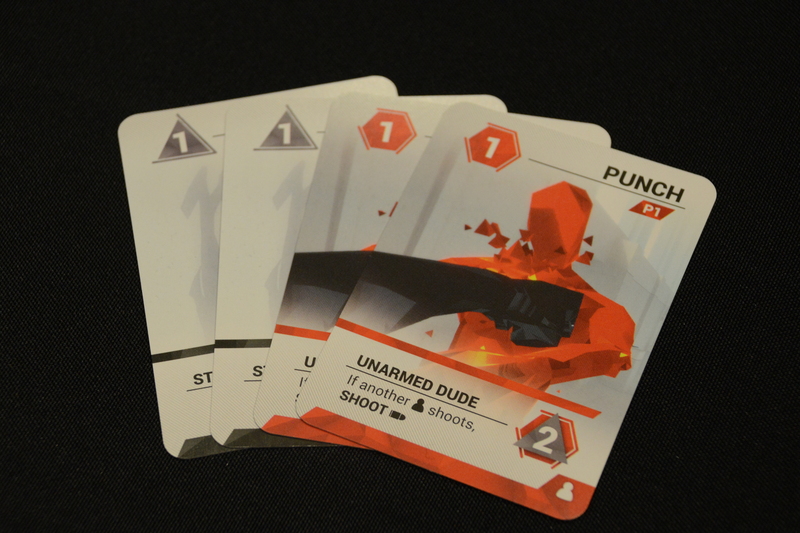 SuperHot is a Kickstarter funded micro-deck builder card game designed by Manuel Correia and published by Board and Dice in Poland. The game features art design and graphics based on the video game of the same name. 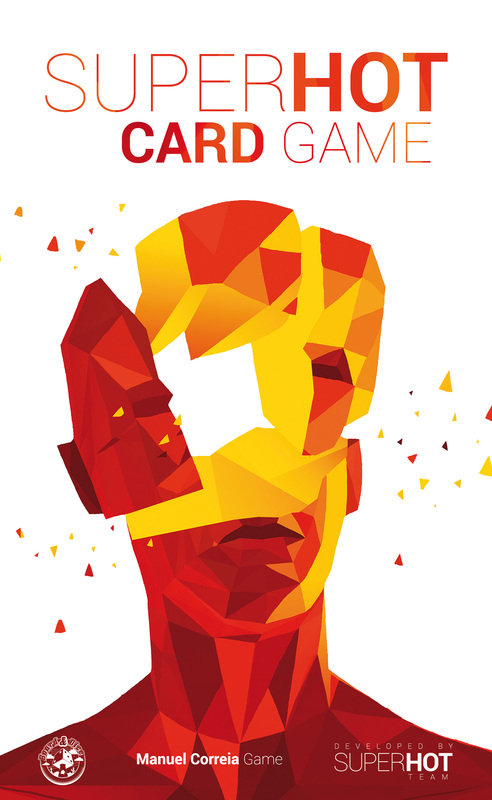 The 1-3 player card game not only features head to head and 2 vs. 1 play but also co-op and solitaire play. In solo mode, you lose the game if you ever have four bullet cards in your hand, the bullet deck runs out, the obstacle deck runs out of cards, or you have to refill your hand to four cards and you can’t. There are three levels you must complete in increasing difficulty in order to win. The first level has one goal card chosen at random from a deck of 25. Then, two goal cards in level 2 and finally three goals in level 3. You do get a mulligan once per level but the goal card must be in the next level. Once you complete all goal(s) in a level, you shuffle up all the obstacles cards as well as your own deck and discard pile, and draw new goal cards to start the next level. Six cards are dealt from the obstacle deck in a row to form the Line with the 7th card on top of the obstacle draw deck to show you what’s coming in the next round. Thematically, this represents the current “room” you are in and the things you can use to hide from the “dudes” in the room, or use to fight them. Additionally, there are items that can help you too like pliers to pull the pull the bullets out of you! In the bottom ten cards of the obstacle deck, a bullet card from a separate 12 card bullet deck is shuffled in. 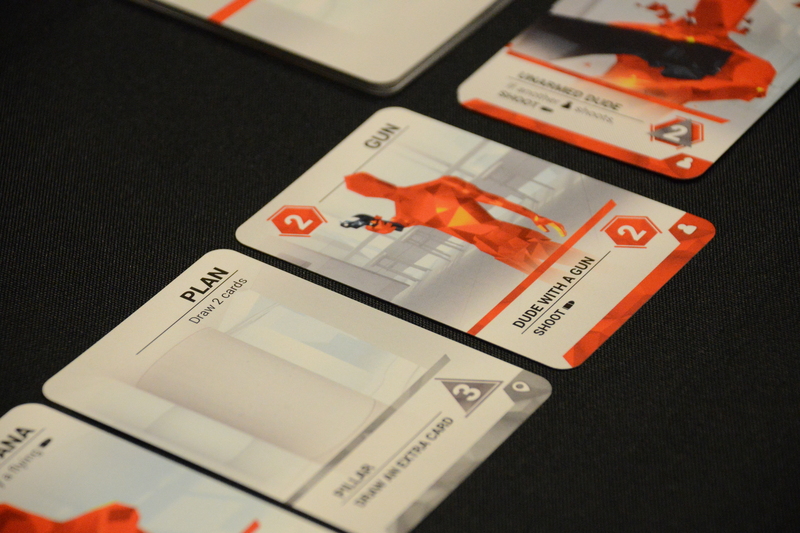 The player’s starting deck is made up of eight starter cards and four cards are drawn to form your starting hand. 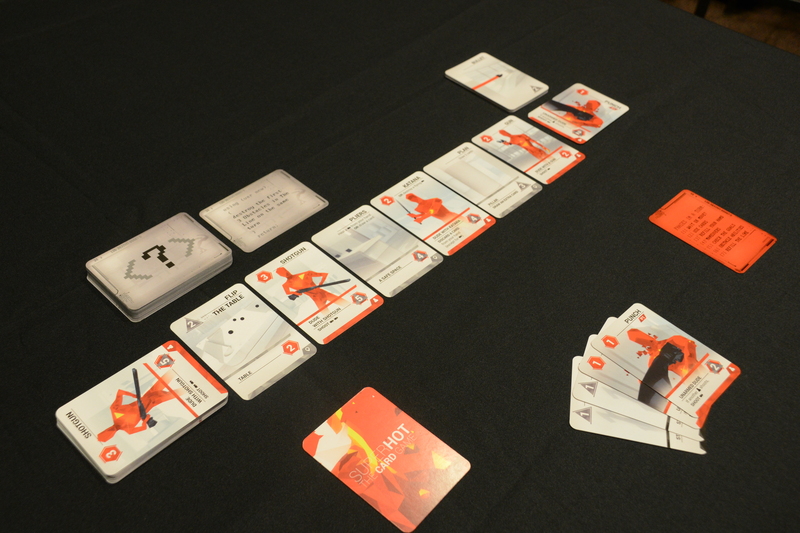 The player plays defense cards with values equal to the defense cards he or she is trying to defeat. The same goes for attack cards. Plus, there are cards where you may use a combination of both attack and defense together. Cards in the Line are either defeated or knocked out. The unique aspect of this game is cards that are defeated go into your deck’s discard pile, while cards you played or cards that are knocked out (by flipping them over) in the Line go into the obstacle deck’s discard pile to show up in a later round in the line. After the player’s cards are played, the player refills his or her hand to four. Next, the number of cards the player has played will determine how many slots from right to left in the Line are placed in the player’s discard pile whether there is a card in the slot or not. Then, the remaining cards in the Line with effects at the bottom trigger. Not all are bad. Some let you draw a card, or do nothing; while others may force you to place a bullet card into the obstacle discard pile. These are bullets are coming…you know they are! In the last phase of the turn, the Line moves to the right and then is refilled from right to left back to six. A “Gun” card is about to shoot! What’s really interesting about this game is how cards you play don’t go into your discard but instead come back to haunt you in a new room later. So, what is critical here is the timing on which cards you play and when. You need to be effective in which cards get defeated into your discard and which go into the obstacle discard to fight you later. Card effects in the line before it refills can have a positive or negative impact on you and affect how you play the game. All of this can be mitigated on how many cards you play in order to defeat cards to your discard pile. A typical starting hand of attack and defense cards. 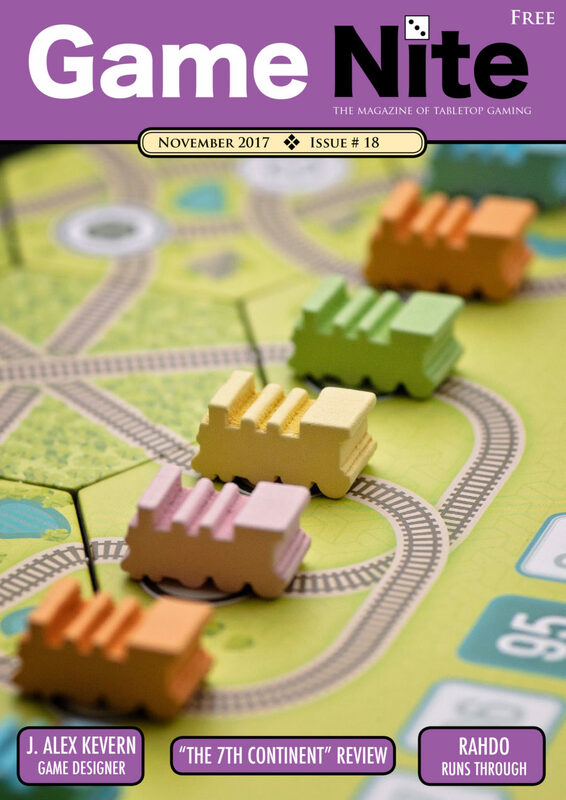 Thematically, the game ties in well with its video predecessor. Only when you move does the game move. As you play cards, things happen, bad guys and bullets move in the room. You see the bullet coming at you. Can you slice it out of the air with your katana or will it inevitably hit you? As a whole, Superhot is a unique micro-deck builder. It’s not overly complex but does offer some interesting decisions. It plays fast and although the game play is very “samey” the large number of goal cards make the game challenging every time as well as offering that “let me play just one more time” feel.